The following are frequently asked questions about the Office 365 Developer Program. What is the Office 365 Developer Program and who should join it? As a program member, you can get a free Office 365 developer subscription with 25 user licenses to use to build your solutions. This subscription will remain active for as long as you’re actively developing and deploying solutions. For more information, see Join the Office 365 Developer Program and Build Office 365 solutions. How does the Office 365 developer subscription work? If you join the Office 365 Developer Program, you qualify to get a free Office 365 developer subscription. This is a special subscription designed to be used for application development only, and comes with 25 user licenses. After joining the Office 365 Developer Program, you'll have the option to receive and configure an Office 365 developer subscription. Your subscription is good for 90 days and can be renewed for another 90 days for as long as you're using it for development activity. For more information, see Set up an Office 365 developer subscription. How many user licenses can I add with my subscription? Why don’t you offer a one-year subscription? In April 2019, we transitioned to a new model where your subscription can be renewed perpetually every 90 days if you're actively using it for development. We believe that this model ensures that developers who are actively developing solutions have a subscription for as long as they need one. If you're developing frequently, your subscription never expires; it is automatically extended. If you're developing for a short time, and your subscription expires and is deleted, you can sign up for a new one. If you prefer to have a subscription that is available for a longer time, we recommend that you get the Visual Studio Professional or Visual Studio Enterprise subscription. These programs include a free Office 365 developer subscription that is good for the life of your Visual Studio subscription. To access this, go to Visual Studio | My Benefits. For more information, contact Visual Studio customer service. How do you determine whether a subscription can be renewed? We use a set of algorithms and telemetry that we get from your activity in the Office 365 Developer Program and on your Office 365 developer subscription to determine whether you are actively developing. We check these regularly to update your status and determine whether your subscription should be extended. If you think we somehow missed tracking your development activity accurately, you can let us know via your dashboard. To submit a form that tells us how you are using your subscription for development, in the dashboard warning, choose the Let us know link, as shown in the following image. We will review your request and let you know if you qualify for an extension. How do you define development activity? 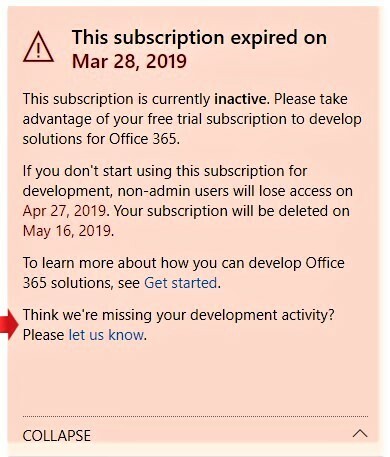 Your activity in the Office 365 Developer Program and on your Office 365 developer subscription determine whether you are actively developing and whether your subscription should be extended. What development activities do you track? What's included in the Office 365 developer subscription? Does the subscription also include a subscription to Azure? This offer does not include a subscription to Azure. However, to receive free access to Azure services, you can create a free Azure account. How long is my subscription good for, and when does it expire? Your subscription is good for 90 days and is renewable based on valid developer activity. If you're using your subscription for development, it will be renewed every 3 months and will last indefinitely. You can find the expiration date, along with your subscription name, on your Office 365 Developer Program dashboard. For more information, see Subscription expiration and renewal. If you're joining the program through Visual Studio Enterprise or Visual Studio Professional, your subscription is automatically renewed until your Visual Studio subscription expires. When my subscription is about to expire, can I extend it? The only way that you can extend your subscription is to do valid developer activity. If you're using your subscription to develop custom solutions, your subscription will expire and will eventually be deleted. For more information, see Subscription expiration and renewal. If my subscription is going to expire, how much time do I have before it is deleted? You have 30 days after your subscription expires to migrate any data. For the next 30 days, only the admin will have access to the subscription, and on day 60, the subscription and all data will be deleted. What account can I use to sign up for the Office 365 Developer Program? Microsoft account (created by you for personal use) - Provides access to all consumer-oriented Microsoft products and cloud services, such as Outlook (Hotmail), Messenger, OneDrive, MSN, Xbox Live, or Office 365. Signing up for an Outlook.com mailbox automatically creates a Microsoft account. After a Microsoft account is created, it can be used to access consumer-related Microsoft cloud services or Azure. Work account (issued by an admin for business use) - Provides access to all small, medium, and enterprise business-level Microsoft cloud services, such as Azure, Microsoft Intune, or Office 365. When you sign up to one of these services as an organization, a cloud-based directory is automatically provisioned in Azure Active Directory to represent your organization. For more information, see Manage your Azure AD directory. Visual Studio ID (created for your Visual Studio Professional or Enterprise subscriptions) - We recommend that you use this option to join the developer program from within the Visual Studio Gallery to get the full benefits as a Visual Studio subscriber. As a Microsoft Partner, can I receive a subscription? Yes, you can follow these instructions to join the Office 365 Developer Program and set up an Office 365 developer subscription. However, if you already have a Visual Studio Enterprise or Visual Studio Professional (MSDN) subscription, you can get an Office 365 developer subscription as a benefit. To access this, go to Visual Studio | My Benefits. For more information, contact Visual Studio customer service. As a full-time Microsoft employee, can I receive a subscription? Microsoft employees cannot sign up for this offer. However, all Microsoft full-time employees have access to a free Visual Studio (MSDN) subscription that includes access to Office E3 Developer. You can access this benefit at Visual Studio | My Benefits. As a vendor working at Microsoft, do I qualify for a subscription? Yes, you can follow these instructions to join the Office 365 Developer Program and set up an Office 365 developer subscription. But even for vendors, this subscription is designed to be used for application development only. If you are not doing valid development activity, your subscription will not be renewed. Is the Office 365 Developer Program available in my language? In addition to English, the Office 365 Developer Program is available in the following languages: Chinese (Simplified), French, German, Japanese, Portuguese (Brazil), Russian, and Spanish. Is the Office 365 developer subscription available in my language? The Office 365 developer subscription is only offered in English.